Brigadier General (ret’d) Ioannis Galatas, MD, MC (Army), is a retired military physician with 35 years of military industry experience (Army Medical Corps). He is specialized in Allergy and Clinical Immunology (Board certified) and for more than two decades he served as Head of the Department of Allergy & Clinical Immunology at Army General Hospital of Athens, Greece. Since 2001 he has been involved in CBRNE operations as planner and instructor trained (including live agent training) in a number of countries abroad. His main passion focus on “Hospitals’ CBRN Defence & Preparedness in Megapolis Environment”, “CBRNE Design/Hardening of Critical Infrastructure” [airports, shopping malls, hotels etc.] and “CBRN Forensics & Management of Contaminated Corps”. During the 2004 Athens’ Olympic Games, he served as Commandant of the Olympic Hospital CBRN Response Unit – the only hospital-based specialized unit (70 people) deployed for the Olympic & Paralympic Games. He holds an MA. degree (with merits) on “International Terrorism, Organized Crime and Global Security” from Coventry University, UK (2010) and he is a PhD candidate (Athens Medical School/Dept of Forensics & Toxicology). 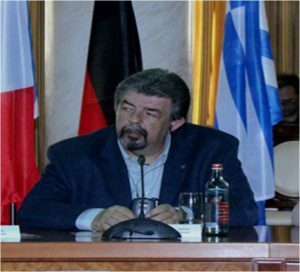 His last appointment (as of August 2010), was as Head of the Department of Asymmetric Threats at the Intelligence Analysis Branch, Joint Military Intelligence Service of the Hellenic National Defense General Staff in Athens. After retirement he conducted CBRNE classes for Abu Dhabi Police Authority and continues to participate as invited speaker in many CBRNE/security conferences, congresses and workshops around the globe. Currently he is the Editor-in-Chief of the monthly on-line “CBRNE Terrorism Newsletter” initiated in November 2005 and delivered freely to CBRNE-CT First Responders of more than 80 countries around the globe. He is also a CBRNE Senior Research Associate at “Center for Security Studies” (KEMEA), Athens, Greece (under the Ministry of Public Order & Civil Protection) with special focus to disaster/terrorism related projects and a Research Associate at “National Nuclear Research Center Demokritos”. As of January 2015, he is member of the Didactical Board of University of Rome “Tor Vergata” delivering classes for their “International CBRNe Masters” programs and a CBRN consultant for Catholic University of Sacred Heart Gemelli Policlinico (EDEN EU Project). Monitor the developed tools and prepare their validation and their wider implementation. Pursue (or propose/extend) new CEN workshop agreements initiated by the FP7 Projects or initiated under the current Horizon 2020 projects. Provide various training courses both core and specialized (individual; collective; command level), with special emphasis on “live agents’” training along with newly developed courses adopting modern needs – i.e. CBRN forensics. These courses are materialized via relevant collaborations with training facilities in 6 countries (Belgium, Austria, Sweden, Czech Republic, Belarus and Ukraine). Participate in analysis of countering CBRN hazards requirements. already been made to the following research consortiums: TOXI-TRIAGE (2016-2018) and EDEN (2013-2016). In addition, there are 21 similar proposals in progress addressing CBRN related consortiums both active and already having finished their works. The CBRNKC aims to address certain topics relevant to CBRN issues in urban environment and is planning a series of activities throughout the coming years. Spreading the CBRNE-CT knowledge in the local community and neighbouring municipalities. Along with the ICI Newsletter (soon to be E-News), the Manager of the CBRNKC has brought under ICI’s roof the “CBRNE-Terrorism Newsletter” that his team edits since 2005. It is a monthly online digital magazine dedicated to CBRN and counter-terrorism First Responders in more than 80 countries worldwide. The Newsletter has chapters on: Chem News; Bio News; Dirty News (R/N); Explosives News; Cyber News; Emergency Response &Preparedness; Asymmetric Threats and Business Continuity News. Periodically “Special Collections” are uploaded in Newsletter’s website addressing interesting single topics (i.e., CBRNE Drones; Piracy of Cruisers in the Mediterranean Sea and many more). The CBRNKC pool of experts and partners will soon be able to publish, on the member’s section of the ICI website, more specialised publications addressing in depth issues of interest to CBRN community (e.g. “Selecting personal protective equipment for Ambulance Service”; “Selection of detection equipment according to tasks to be performed”; “CBRNE Forensics” and many more). A series of “CBRN Martial Arts” videos will be co-produced by ICI staff addressing the critical issue of personal protection while wearing PPE and into close contact with panicked/frustrated contaminated victims. The CBRNKC will strongly support R&D initiatives that will provide solutions to existing requests from end users and organisations. Since cost is a major barrier for not implementing preparedness strategies, R&D might help reducing costs by bringing industry and customers into close contact and collaboration. The given pool of CBRN experts possess dexterities that can be useful to others also. As such, a complete proposal for the development of a “HazMat/CBRN Institute” will be presented to different interested States during 2017. CBRNKC is readily available to provide CBRN-related consultation upon request at your own premises world-wide. Whether you are a hospital, a shopping mall, an airport, a church, a university, a mega event organizer or a nuclear power plan, we do have the experts, the hand-on experience and capabilities to provide anthropocentric, viable and effective solutions. But most important of all is that we consider your business or organization as our own and your people as our own colleagues and therefore we will do our best to protect both from conventional and asymmetric threats. The unexpected always happens! If you would like CBRNKC to organize a tailored conference or workshop or a specific training (e.g. chemical decontamination), please contact us! CBRNKC is interested to organize a workshop that will bring together CBRN First Responders and Architects/Civil Engineers. When these two communities will exchange ideas and unveil needs and gabs a safer critical Infrastructure potential will become a reality. It is much easier and cheaper to design CBRN proof structures that to harden them afterwards. If interested, please contact us! CBRNKC is interested to create a “CBRN R&D Cell” that will explore more ergonomic and economic solutions in the area of mass decontamination. If interested to join this effort, please contact us! CBRNKC is especially interested in introducing “CBRNE Medicine” into university medical and nursing schools EU-wide and internationally. If you share the same vision, please contact us! the main objective of the CBRNKC is to gather all CBRN-related experts, organisations and related industries under a single roof at European and international level. Only by working together we can achieve our goals and help our societies confronting the plague of terrorism that recognizes no borders and make no country immune of terrorism. Join the CBRN KC and become a member of a thriving community addressing the threats of tomorrow.